Coal has played an important role in modern industry. 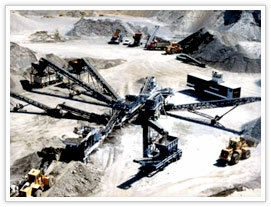 The coal is processed and crushed to increase the efficiency and protect environment. In order to use coal more rationally, efficiently and effectively, the coal need to be processed and crushed into different sizes, 0 ~ 25 mm particle size for coal gas stove , 25 ~ 8 mm for steam locomotive, 25 ~ 6 mm for the industrial furnace, and coal power plant requires grain coal of 0 ~ 25mm. The general hardness of coal is 1-4. After coarse crushing by jaw crusher, fine crushing by impact crusher, and sieved by vibrating screen, coal can be processed and crushed into different sizes of the requirements. SBM jaw crusher, impact crusher for coal crushing have been widely used in the coal industry and mining industry, for its high and unique quality. They can crush coal at large quantity and high efficiency. In addition, SBM vertical shaft impact crusher can crush coal into much smaller sizes to meet specific requirements. The particle size of slack coal is 0 ~25 mm. The slack coal is often used as combustion agent in steel company, thermal power plant, etc. The consumption of coal is quite large in thermal power plants. Take a 1 million kW thermal power plant for example, coal consumption amounts to 11,000- 13000t a day, which takes 60% ~ 80% of the cost for generating electricity. It is advisable to adopt appropriate coal mill for coal grinding. This can not only improve the utilization of coal, but also contribute to energy saving, environmental protection, economic benefits. According to the market research, vertical coal mill is used most widely. There are also other grinding mills like traditional raymond mill, roller mill, trapezium mill, etc. can also meet different requirements for grinding coal into different sizes and types. Customers can choose an appropriate coal according to their specific needs.